I was looking for a virtual storage solution at VMworld. In the Solutions Exchange I have found two vendors with products I want to take a closer look at. One of them was StorMagic with SvSAN 5.2, Mark Christie a Senior Systems Engineer was so kind to present me the solution. You can use SvSAN for both, VMware vSphere and Microsoft Hyper-V. All you need to do is to deploy a Virtual Storage Appliance (VSA) on every ESXi host. This appliance is delivered as an .ovf file – so deployment only takes some minutes. To avoid “Split-brain” scenarios, StorMagic is using a quorum service (they call it Neutral Storage Host, short: NSH). This windows service can be installed on any Windows OS Server, but it should not be installed on an server hosted on an ESXi host that is part of the SvSAN. StorMagic supports three different quorum configurations: local quorum, remote shared quorum or without a quorum. 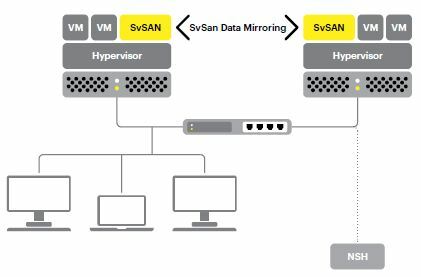 SvSAN is using Synchronous Data Mirroring between the nodes. This means that a write operation is only completed when both VSA nodes have acknowledged it. As both copies of the data are active, both of them are available for I/O operations. SvSAN enables you to stretch a storage cluster over two different locations. If you want build a streched cluster you need multiple network connections – unfortunately I found no further information about sizing. In case of a hardware failure SvSAN will initiate a failover to the remaining side. Of course there is also a scenario for failback. Eg. SvSAN will rebuild and resynchonize mirror targets automatically. Since version 5.2+ SvSAN supports caching. SSDs are used as a staging area, providing faster response times for random I/O workloads and lower latency. It is also possible to use per target caching. This enables you to select only the targets that need to benefit from I/O acceleration. VMware vSphere Storage API for Array Integration (VAAI) is supported, too. StorMagic SvSAN is licensed based on usable storage capacity. The smallest license starts for up to 2 TB, next steps are 4 TB, 8 TB, 16 TB and last but not least for unlimited storage. The good news is, that there is an fully functional 60 days evaluation license available. So you can test the software for free before you have to decide if you purchase it or not. There is a webclient plug-in available to manage the SvSAN, but you can also manage it via webGUI or PowerShell CLI. To identify and analyze performance hot spots there is a Performance Monitoring available.